Some small meniscus tears have no symptoms at all and may disappear on their own. Other less severe or non-complex tears will subside with conservative treatments, especially if your knee is stable and doesn't lock. 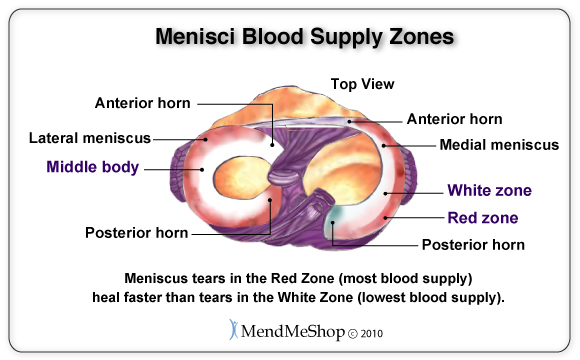 These tears are often located on the outer edges of your meniscus and have access to a lot of blood supply. It is the blood in your body that heals and repairs damage to your tissue. By transporting oxygen and nutrients to the damaged tissue and flushing away dead cells, your blood helps your body to heal itself. 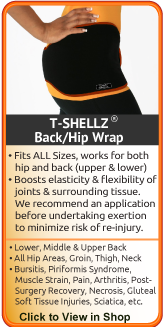 Unfortunately, when a meniscus injury occurs and you have knee pain you need to prevent further injury and rest the area to allow it to heal. By resting, you actually limit the flow of blood and slow the healing process. 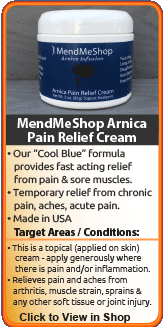 The trick is to slow tissue damage, reduce scar tissue, and generate blood flow to speed healing and prevent further damage. Younger patients tend to have higher success rates with meniscus injuries than older individuals, as their conditions are generally a result of trauma to healthy tissue rather than degeneration over the years. 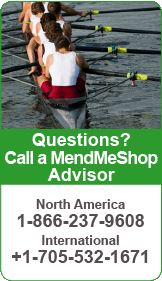 Individuals with a discoid meniscus will often receive conservative treatments if they experience no major pain. However, surgery is often used if symptoms do not subside as they grow. Once inflammation and swelling have been reduced in your knee, nourishing and strengthening the tissue in your joint is the goal. 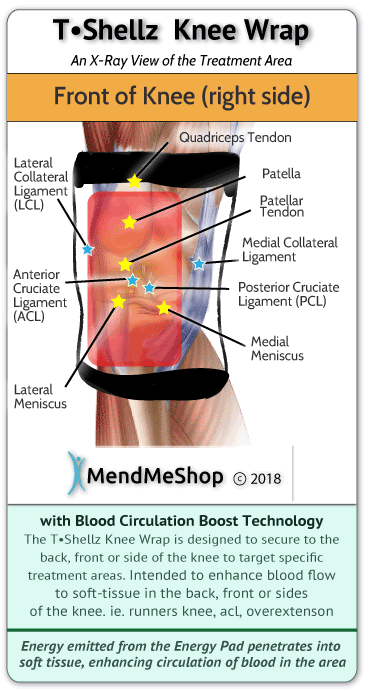 Deep Tissue Regeneration Therapy (DTR Therapy) promotes blood flow to the treatment area bringing the necessary oxygen and nutrients to your meniscus and other weakened tissue. DTR Therapy speeds up the body's natural repair process for faster healing and stronger tissue. Remember, the meniscus is cartilage and does not receive much blood flow naturally and when you rest your knee, you are not creating the natural blood flow your knee usually receives. With the use of Deep Tissue Regeneration Therapy you can increase your body's blood supply to the knee and healing power. In addition, the fresh blood flow whisks away dead cells and toxins (including lactic acid, commonly found in trigger points) that have built up from the injury leaving the area clean and better prepared for healing. 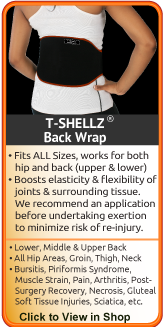 Our Knee T•Shellz Wrap® provides effective, non-invasive, non-addictive pain relief with no side effects. Keeping your knee as healthy and strong as possible throughout the healing process will allow you to get back to your regular activities faster. 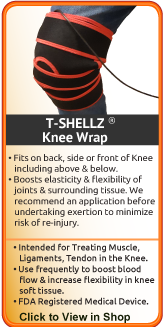 The Knee T•Shellz Wrap®, available exclusively from MendMeShop®, provides effective, non-invasive, non-addictive pain relief and healing with no side effects. 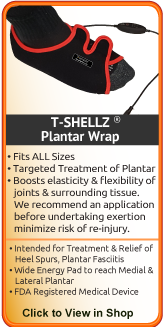 The benefits of DTR Therapy do not end once your knee pain stops! 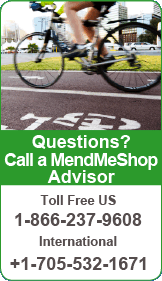 Even when your meniscus has healed, your activities can put your knee at risk of an overuse injury, tightness, or another tear. 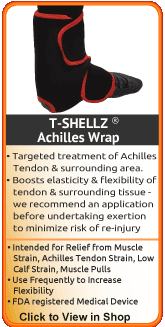 An T•Shellz Wrap® treatment before activity is an easy way to warm up the knee tissues and prepare them for use. Then, end your day with another treatment to prevent tightness from setting in overnight. This incredible healing tool will be the ticket to healthy knees for years to come! During your recovery, you will probably have to modify and/or eliminate any activities that cause pain or discomfort in your knee area until your pain and inflammation settle. With these therapies you will notice great improvement within a few weeks, with most meniscus patients seeing some improvement quickly. The more diligent you are with your treatment and rehabilitation, the faster you will see successful results. If you start using your knee before it has a chance to heal properly (even though it may feel better), you can end up doing a lot more damage than good! Gentle massage around the injured knee area or small flexing or extending knee movements (if not painful) will also help increase blood flow, oxygen, nutrients, and will prevent stiffness. Once your pain starts to diminish, a physiotherapist will set up an individualized knee and leg strengthening and stretching exercise program for you to perform at home or in the gym. This will be based on your needs and abilities, and will help you return to performing your normal routines. Individuals will often exercise or lift weights on their own to try and build up their strength; however in doing so, they can do more damage. It is extremely important to strengthen your muscles properly, as they may have weakened during the period of non-use. 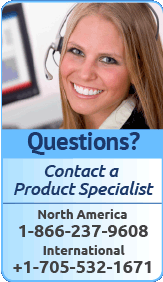 A trained therapist will help to ensure your rehabilitation process is effective. For best, long-term results use physical therapy along with an exercise program.